Crabs that live on rocky shores feed within the hard rock substratum. For this reason they are opportunistic scavengers and will eat just about anything. Some crabs will eat small snails and limpets. 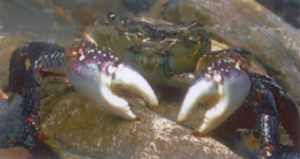 Crushing crabs have very strong plier-like claws to break apart the animal they are feeding on. Crabs also use their claws to carry their food to their mouth. Crabs are extremely sensitive to any nearby movements or vibrations.